Antoinette Hamilton, Assistant Vice President of Diversity and Inclusion at L’Oréal USA, addresses the New York Coalition of One Hundred Black Women’s 2013 Role Model students. 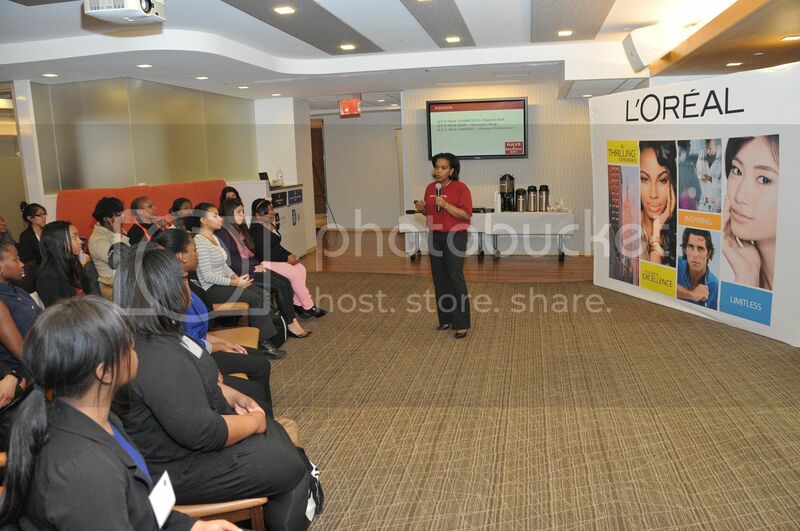 NEW YORK, NY— L’Oréal USA hosted 14 high school and 32 college students on April 22nd at its Fifth Avenue headquarters during Spring Break as part of its support for the New York Coalition of One Hundred Black Women’s annual Role Model Program. This initiative allows young women to learn practical workplace skills and to shadow professional women in their chosen careers for one week during spring semester break. “L'Oréal USA values programs that empower women and girls. 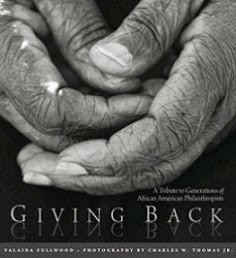 In 1999, our initial grant enabled the New York Coalition of One Hundred Black Women to expand its Role Model program beyond the borough of Manhattan, into Brooklyn and Queens, to students of Medgar Evers College and Queens College. Since that time, the program has further expanded to include York College, LaGuardia Community College, and others, and now also includes high school girls,” said Antoinette Hamilton, L’Oréal USA’s Assistant Vice President of Diversity & Inclusion. “Today, through our multi-year partnership, we are proud to have contributed more than $300,000 to the Role Model program including more than $15,000 in scholarships awarded annually to program participants,” Ms. Hamilton noted. “The Role Model Program is the Coalition's signature program, which has been very successful since its inception in 1979. Our partnership with L'Oréal USA has served to strengthen and expand this program and is an excellent example of the synergy created by the collaboration of a major corporation and a non-profit volunteer organization,” said Avalyn Simon, President of the New York Coalition of One Hundred Black Women. The college students were selected from City College of New York (CCNY), LaGuardia Community College, Medgar Evers College, Queens College, York College--and new to the Role Model Program this year--John Jay College of Criminal Justice. The high school students attended the Women’s Academy of Excellence in the Bronx or are members of the Xinos Group of the National Sorority of Phi Beta Kappa in Queens. The students participate in an intensive series of workshops with professionals who expose them to the realities of the workplace. During the week, the college students spend two full days with mentors while the high school students attend cultural presentations, which this year included viewings of the New York Historical Society’s exhibit Martin Luther King The Dream Continues: Photographs and “UMOJA – No Men Allowed” – a documentary screened at the Producers Club. The Role Model program has notable successes with former mentees ‘paying it forward.’ Linda Chesney, the program’s York College coordinator, was herself a Role Model student from City College in 1992. She is currently the Director of Career Services at York College. Twenty-three years ago, New York architect Zevilla Jackson Preston responded to a recruitment drive for the program at City College. Preston was selected to participate by faculty contact and Role Model Program coordinator at the college, Joyce Connelly-Simmons. Ms. Preston is now a Registered Architect and Founder and Principal of her Harlem-based firm, J-P Design, Inc. which she opened in 1993. This year Ms. Preston was a mentor and role model to CCNY student Shanay Cook who became interested in architecture after a trip to Costa Rica some years ago. The week of workshops and job shadowing culminated with a closing ceremony, program review and scholarship presentation including a keynote address from City University of New York Senior Vice Chancellor and Secretary of the Board of Trustees Jay Hershenson who noted that students today have different challenges because their competition is no longer from the neighborhood or surrounding areas, but from around the world. He encouraged the students to work on developing three important keys to success, the ability to communicate well, the skills to identify and seek out information and opportunities, and the motivation to be persistent. The scholarship winners were, first place, Nacilia McCarthy of York College; second place, Carlene Bobb of John Jay College, and third place, Stephany Ramales of LaGuardia Community College. The Role Model Program is co-chaired by Cheryl Green-Foster, First Vice President, Corporate Sponsorship and Strategic Planning and Janice L. Tyson. Committee members are Elizabeth Carde, Cheryl Goggins, Barbara Kairson, PhD., Sharon Long and Yvonne Sterling. 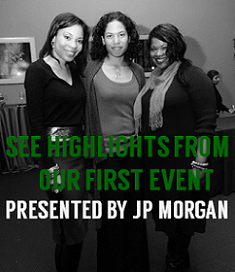 The New York Coalition of One Hundred Black Women is a non-profit organization addressing social, economic, political, cultural and other issues of concern to Black women in the five boroughs of New York City and beyond. The organization is dedicated to improving the quality of life for its members, their children and extended families, as well as in local communities and the larger city, state and nation. For more information about the organization go to www.cobwfounders.org or contact the NYCOBW Executive Offices at 208 East 79th Street, Suite 250A, New York, NY 10021, 212-517-5700.